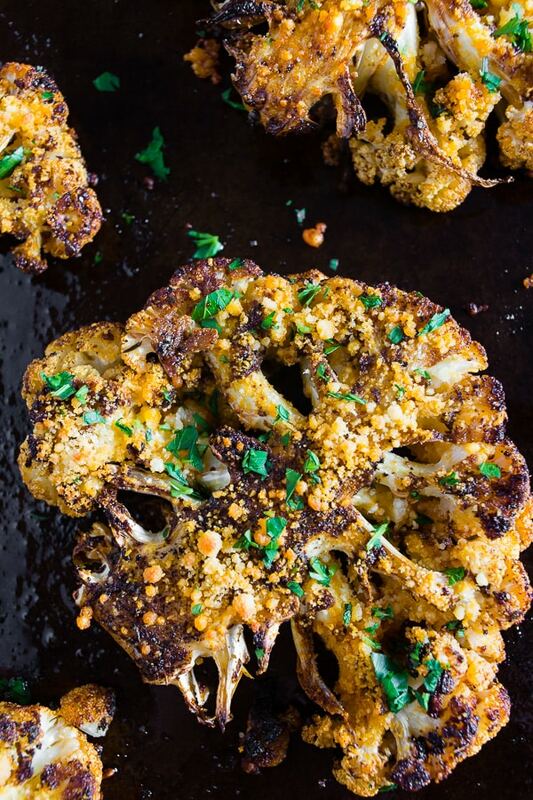 This Parmesan Cajun spiced cauliflower steak is the perfect menu addition to all your meatless meals. It also works perfectly as a flavorful side dish. 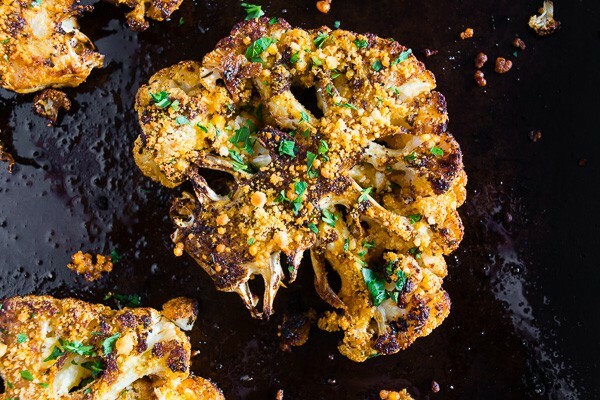 This dish will turn everyone into a cauliflower lover! Ok, I know cauliflower isn’t really meat but I’m gonna sit right here and call it steak anyway. I mean, if I went to a party and someone said we were having steak and they put this on my plate I might revolt BUT there is not bait and switch happening here. I’m telling up front it’s cauliflower. I’m not Chris Traeger bringing lentil loaf instead of cake to a party. If you get that reference we can be friends. 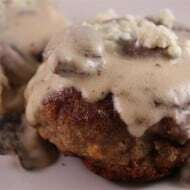 Now, I know you keep seeing a lot of cauliflower recipe floating around the web and that is mostly because cauliflower is the BEST! Well, to be honest, it’s always been one of my favorite vegetables. I love it steamed, grilled, roasted and obviously even in steak form. For this version of cauliflower steak, I went ahead and packed this puppy with all. the. flavor. For real. It’s not just a sprinkle of salt and pepper – NOPE! I rubbed it up with cajun seasoning, a little kosher salt and then some Parmesan cheese. HECK YES! Of course, the amount of salt you add is going to depend on how salty your Cajun seasoning blends is and how much Parmesan cheese you use. Sooooooooo be careful. I’m warning you now. Taste that seasoning blend first! The one I use has very little salt BUT a lot of the ones you find in the store are salt bombs. Also, aren’t these little Parmesan Cajun spiced cauliflower steak just the cutest? After you cut your steaks you’ll have some leftover cauliflower so I just saved mine to roast the next day. One can never eat too much cauliflower – am I right? Preheat oven to 425 degrees and line a sheet pan with parchment paper or a silpat liner, set aside. Remove green leaves from your head of cauliflower. Turn your cauliflower stem side up and cut out as many 1 inch thick "steaks" as you can from your head. The end pieces usually fall apart so the best cuts from the middle. Gently lay your "steaks" on the prepared sheet pan. In a small bowl mix together olive oil, Cajun seasoning and kosher salt. Remember to tastes your Cajun seasoning first to know if you need to add less salt and to test its spiciness. Brush on oil/seasoning mix making sure to coat the whole cauliflower steak. Make sure you gently flip the steak to coat so it doesn't fall apart. Add to your pre-heated oven and cook for about 10 minutes or until ti starts to slightly soften. Remove from the oven, flip and cook for about 5 minutes. Remove, sprinkle the tops of the steaks equally with Parmesan cheese. Add back to the oven and cook for another 5 minutes or until soft. Notes: If you cut your steak thinner will take less time to good. If you cut it thicker it will take more time. Adjust accordingly. I’m loving all of this cajun flavoring! Cannot wait to try this! Cauliflower is by far my favorite veggie! I love how many different uses it has! I’ve got to try this out! Thank you for sharing! I am a total cauli freak but I have yet to make a cauliflower steak! This is a crime and I need to make this ASAP. It sounds delicious and I a, digging the cajun flavor here. I think this is brilliant. 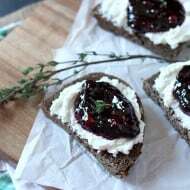 Can’t wait to make this very very soon. 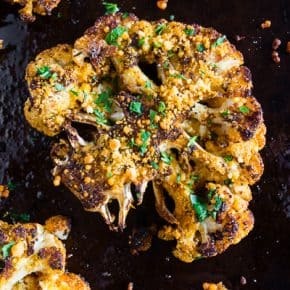 What a great looking cauliflower steak!! Love cauliflower ANYthing! Such a healthy dinner too! OMG!! I am loving this! Its fantastic!! 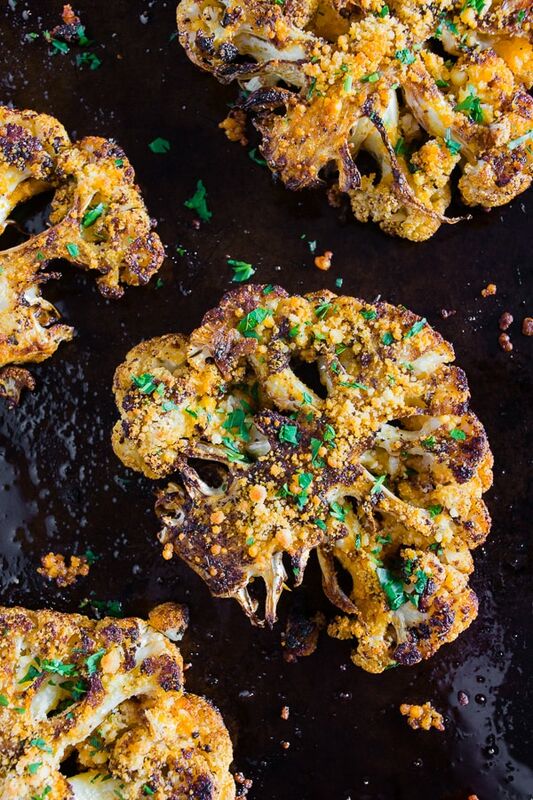 I love cauliflower in any form, and these look gorgeous! 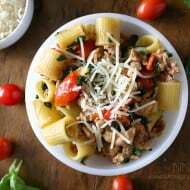 I could eat this for lunch and then as my side dish for dinner! This is glorious! I’m on a cauliflower kick lately and this is one of the best dishes I’ve seen lately.